Now that Borders is in bankruptcy and at least 200 stores closing, some people have asked me what I think is going to happen to brick and mortar bookstores in the future. Do they have a future? Will they survive? There’s one comparison I keep coming back to: record stores. When you consider that the digital revolution happened in music a little over a decade ago, it’s interesting to see what has happened to record stores since the rise of the mp3. Basically: carnage on a massive scale. A huge number of stores closed, especially national chains. First it was Tower Records, then Virgin Megastores (here in the US), and now, well, Borders. And an interesting fact to bear in mind is that digital revenue still has not surpassed physical. It’s debatable about whether we’ve really seen a digital tipping point in the music industry. Declining overall sales (likely due at least in part to piracy), and a shift to online music vending and digital music was enough to tip the balance away from profitability for most brick and mortar chains. Now there’s a seriously fractured landscape. Record stores haven’t disappeared entirely, but there’s a whole lot less of them. 1) The Aquarius Records Model. Aquarius Records is a very small record store in the Mission District known for its hand-picked roster of sales and its knowledgeable staff. It’s small, it’s intimate, they support local artists, you go there knowing what kind of music they sell and you come away with new discoveries you might not have found otherwise. You’re not going to find a vast selection or Justin Bieber’s latest album, but you will find some gems you didn’t know you were looking for. Bookstore comparison: your small, beloved, curated independent bookstore. 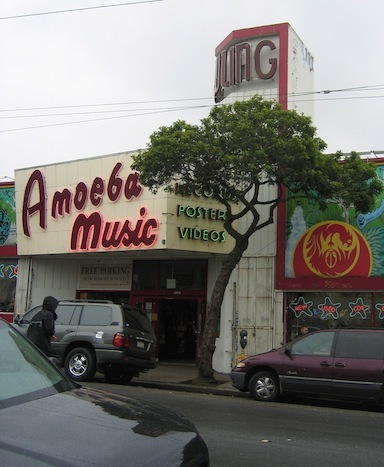 2) The Amoeba Music Model. Amoeba is a very large record store in the Upper Haight (a neighborhood you may know as Haight Ashbury if you’re not from ’round these parts) that has a massive, gargantuan selection of used CDs for low prices. Buy/sell/trade/awesome. They also have locations in Berkeley and LA. 3) The Costco Model. San Francisco doesn’t have a WalMart, but we do have a Costco. And they sell music. In fact, big box stores sell a whole lot of music: mass merchangs like WalMart and Target accounted for 33% of all album sales in 2010. The selection isn’t great, but they move a lot of CDs. Oh, and I’m guessing you will find the latest Justin Bieber album. And…… that’s basically it. Could these be the types of physical bookstores/booksellers that survive? Sure, this is all an inexact comparison as music isn’t quite the same thing as books. Book piracy has not (at least yet) become the existential crisis that it was to music and bookstores have arguably a bit more potential for incorporating live events into their offerings, at least without upsetting the neighbors with loud music (though some record stores definitely have some great shows). As much as I’m rooting for bookstores, ultimately I find it a bit tough to imagine huge box stores devoted solely to books still around in significant numbers a decade from now. That’s a lot of overhead to support and infrastructure to pay for when they’re competing against online vendors with significantly less or virtually no overhead. It wasn’t a sustainable model for music when a substantial chunk of sales left for Amazon and iTunes, and book box stores are going to face similar challenges. Still, I also can’t imagine bookstores disappearing entirely. There is too much love for physical books, too much value provided by bookstores, and I think people will still pay a premium to shop local and for a personal touch. It may be a perpetually tough landscape to survive in, but I think the gems will make it. Oh, and there’s still one more thing working in bookstores’ favor. Whether through a mix of nostalgia or a thirst for authentic experience, vinyl record sales are the highest they’ve been since at least 1991. What do you think? Are record stores an apt comparison and are there other types of bookstores that will make it? If the day comes when I can't be that cliched guy sitting in a bookstore cafe pretending to write but really watching all the people around me, I seriously won't know what to do with myself. I certainly won't be setting up shop at CostCo–although their pot roast is delicious. Vinyl was the first thing that popped in my brain when I saw this post title! The difference is, though, that for audiophiles there is the opinion that vinyl still produces the best sound if you have the right equipment. I doubt I would hear the difference but music lovers swear the quality is better on vinyl than any other option, esp mp3. Maybe that will change as digital continues to improve. In books, content is king. The nostalgia factor will remain and there will always be the "I have to hold a real book" people, but for the most part the quality of the product doesn't depend on the medium unless the digital file is a victim of sloppy editing (which can also happen with paper). I do think indie bookstores will see a long term benefit with the decline of big brick and mortar chains. Providing an eclectic selection and knowledgable staff offers something to the experience that you will never get online. Plus there's the whole getting to talk to people who love books. The indie music stores are the only dedicated music stores left and they survived because of that same value added service. It will be a niche but loyal market. I agree with the direction bookstores are heading. I personally prefer more independent and used bookstores, but Barnes and Noble is still open and holding on at the moment. There is a more personal touch when you go into those establishments. You may not find the latest novels in a used store, but I enjoy the vast selection available. Record stores are still out there. Best Buy is still in business, which is where I would go to buy a new album. This past Sunday I spent a good 45 minutes digging through the $2.99 Red Lined CD boxes at Positively Records. They buy/trade/sell CDs, tapes, records, movies and memorabilia. I don't think bookstores are going to go anywhere, I think it's just going to change hands. A different experience. I think a lot of it depends on how the store manage to accomodate their community/adjust their structure. Bookstores have long been considered a place to hang out and have coffee–and if they play up their advantages in the areas that are attractive, they have so much more to sell than books. Ambience, community, etc. Those things keep people coming into the stores. Community rooms that can be loaned out to writer's groups/reading groups/tech groups (now that e-readers are the thing) would be a BIG bonus to play up, for example. Do we need eight different stores per major city? Probably not. But that doesn't mean that they should disappear entirely, if they play their cards right. Plus there's the longevity factor–books have not evolved this much in format since the printing press. There's no knowing where it could go…but the bookstore has been around as a presence longer than any record store could've hoped. Music's moved from 8 track to vinyl to cassette to CD to various digitized formats. As a physical commodity, it hasn't been around as long, and the culture of it has switched around much more than the book-buying-reading culture. Things are moving fast, right now, if the bookstores are going to make it they're going to have to play creatively–and offering the culture, to me, seems the best selling point. I live in rural Colorado. You'd be amazed at how many people own horses around here while at the same time owning quite a few cars/trucks/tractors w/plows, etc. I think books will be around just because people like them quite a bit. They feel good. The hang-out factor is huge with bookstores. I've seen quite a few coffee shop/bookstores. Maybe the small, indies will move in this direction rather than relying on books alone. What bookstore is only books in this day and age? Both Borders and Barnes & Noble don't just sell books, but music and movies, too, as well as knick-knacks. About the only stores that specialize in only books are the independent sellers. Interesting topic – I agree with your assesement, Nathan. I think speciality and used book stores will be the wave of the future. And Amazon – if it decides to keep selling print books. I'm not sure about Costco/Walmart model. I keep coming back to printing costs, how much does it cost to print a book, and who is going to print them? Are the printers going to survive the fall of all the major bookstores? Will we move to print on demand? That might work for Amazon, but would it work for Costco/Walmart? Also, I agree with Laurel – e-books are so much more convienent – I know that many say they will never leave print books, but I also see ALOT of converts. Print books are already a slow market, I'm not sure there would be a strong enough market for mass product when most have moved to e-books. So, lots of speculation – but it's all very interesting. I think you're spot-on. It's sad, but makes sense. Used bookstores–or a mix or new-and-used–have always had a slight edge over all-new ones, because the mark-up on used books is so much better than on new. I think people will keep trading around their dusty old paperbacks and collecting first editions forever. Sadly, my allergies to dust and cats don't allow me much time in used bookstores, personally. But it's reassuring to know that there will be a physical space I can still walk into and meet other human beings while browsing for paper. The first time I went into Amoeba I was agog. Heaven! I am a fan of indie sellers. The Strand and Shakespeare & Co in NYC, Montclair Book Center in NJ, but I understand it is not necessarily an ideal model for more rural areas. Watching bookstores evolve or fall to the wayside does not upset me. Change was inevitable,not just brought on by digital formats, but the economy, and I am excited to see the innovation that happens. I think the important factor is time. Looking at the digital music revolution we think 10 years is a long time, but to the forces of history it's the merest moment. A format will never totally die as long as the generation who grew up with it is still alive. People don't like change. As such, we don't have to worry about the disappearance of bookstores in our lifetime or even our children's. But one day when the world is full of people who grew up with e-readers instead of paper books, they'll be gone. It's going to take a couple generations though. I think it is an apt comparison…and, I'm not sure I ever stopped to consider how many of the "alternate models" are a part of my book supply chain. I love Borders, but the truth is, I buy only a small fraction of my books there. If I can find a book at Sam's (an East Coast Costco competitor – warehouse club), Target or a used bookstore, it's likely to be cheaper than Borders. Ditto Amazon. But there's more to it than price. Serious readers continue to argue the benefit of e-books over "real" books much as serious music lovers debate cd vs. vinyl, and many of the same arguments apply. Borders (the one in my town, anyway) has suffered most by trying to be what it isn't. The more it pushed its online connection, the fewer books it made available in its store. I go to the other guys to find the book I know I want (with the exception of my local used bookstore). I go to Borders for the feel and the ambience, and what I used to feel at Borders was the notion of being surrounded by books. By trying to out-Amazon Amazon, they cut back on what they did best. Perhaps it bought them some time, but they lost their heart along the way. It had better take a couple generations. I'm only 25, but if paper books and bookstores disappear in my lifetime, I will seriously have to go on depression medication. Not an exaggeration. Unfortunately I think your comparison between the music industry and the publishing industry, at least as far as megastores, is right on. And I've been wondering when someone was going to bring up the issue of piracy, although you mentioned it in this blog in connection with music only. It's a sad situation *sigh* but your comment about vinyl at the end of your post is hopeful, and I'm certain that books will never disappear. I'm sure every writer agrees on that much. Not really a matter of whether they make it. It's whether they allow an author to actually get a book out there in less than a year. Publishing might also be likened to the film industry. When video became readily available, there was much concern and handwringing that it was the end of movie theaters. Perhaps the mega chains will vanish entirely, but not all bookstores. They will just look different. I sometimes wonder if the closing of chain bookstores will re-open the market to smaller independent stores, the same stores (with, perhaps, slightly different frameworks) that were driven out by the chain stores in the beginning. Small, independent stores that cater to both a paper and digital audience… is there an opening? I saw something interesting the other day. A woman in a Chapters box store (the Canadian version of Barnes and Noble), walking the aisles… with an e-reader in hand. She was browsing, looking at books… and then ordering and downloading the ones she wanted onto her e-reader. This is kind of intriguing. First, it says something important about the experience of live browsing, something (perhaps) that online browsing can't match. Second, is this an opportunity for stores? An e-book discount for purchases made inside the store, through the store's site? No, e-book available? Well, the paper book is right there. I think it will be interesting to see how bookstores respond to the digital market – can they find a way to incorporate it into their sales model? Can they adapt not just what they sell, but how they sell? I do think your comparison is apt, but, as you say, not entirely accurate in a 1:1 ratio. Music has never been, with the small exception of the few years when walkmen were king, a very portable experience. They were always removed, and the switch from analog to digital didn't really effect the experience by the time it came. There was somewhat of a shift from vinyl to mp3, but much less of one, and the switch was mediated by the tape and the CD. Books are a very different. Reading is a very physical act, and the shift to e-reader is a huge one for some. Also, books have, for the past couple hundred years at least, been a portable medium. Taking a book with you isn't a new thing. Taking your library with you is, but then, people don't usually flip from one to the next the way they do music. The true shift will happen when more people have smart phones, tablets, etc., and start using the eReader apps that come free for those devices. Even still, I think there will, for the near future anyway, be need for bookstores. The shift to digital will be a slower process than with music, as the experience-change is a much larger shift. Does that mean B&N will be around forever? Probably not. Book buying will continue to shift to the web. But then, people have been saying that the internet will kill brick and mortar stores for years now, and it hasn't happened yet, at least not at the rate everyone predicted. People like interaction and the experience. For criminy sake, package ebooks and "real" books together! One aspect to consider when considering this comparison is the history, the "why" the major music chains failed. It wasn't so much because they were made obsolete, it was because the industry they supported didn't get out in front of technological change and lost control of the market. Publishing has learned from that lesson…a little. As someone with hundreds of books and a love for the aesthetic if the physical book, I'm frustrated with how the publishing industry has positioned ebooks as an either/or choice when purchasing. If brick and mortar stores have a hope of surviving, the paradigm for how their product is sold must change or Amazon whittle away until there's nothing left. Like I said, I love books, but over the past year 90% of my book purchasing has moved to ebooks, mostly because I have a phone, an iPad and an Kindle that are all much more portable and manageable. But I mourn the fact that I buy the ebook and not the physical book. I'd love to have the book on my shelf and access to the ebook. I'd even be willing to pay extra for the option. I say to you, I would still make all my book purchases at a brick and mortar store if I could go in there, buy the book then come home and download it onto my devices. This is what labels have done with vinyl over the past several years and that's a big part of why vinyl sales have increased. Until the publishing industry fully learns the lesson of the failure of the music industry, the publishing industry is doomed to fail as well. I don't believe music stores are an apt comparison. Close but it's not horseshoes and handgrenades and no cigar. Music playback devices have always been considered hip and cool. From gramaphone players back when, to portable record players, to stereo entertainment centers, to handheld AM transistor radios, to quadrophonic stereo systems, to FM handheld radios, to handheld cassette players, to digitial players, it's been as much about portable music as it's been about status and wealth displays. Books not so much a part of identity, status, and wealth displays. Books are private properties. Borders' bankruptcy on the surface seems a tragedy. But it's chapter 11, a reorganization process businesses go through when their spending outpaces economic reality. It's a way to pass debt off on to creditors' ledgers so business can continue, hopefully not as usual. Borders didn't or couldn't timely face the prospects of declining revenue after an intoxicating ride during the heydays of blockbuster book sales. nor were they prepared to ride out economic downturns, except for the default fallback position of chapter 11. It's too early to write bookstores' obituaries though mega stores boom time is over. Small, intimate, boutique stores are making a comeback, in part because they've adjusted their business models to meet marketplace realities, mostly because consumers adjusted their realities. Trimming fat and getting down to streaks of lean is the economic climate for the current and near term outlook. Thing is there's more bookstores than ever, just not geo centralized in inconvenient single structure locations. Same with music stores, video stores, hardware and home building material stores, superstores. Discount big box item big box stores, they're here to stay, just taking it in the pocketbook along with the rest of us. I think in order to survive, in general, bookstores will have to learn how to sell not just books, but the experience. Maybe by going with larger, more comfortable cafes (like a giant set of Friends), more store organized & promoted reading groups, more in-store author meet-and-greets, etc. People no longer have to leave their house to get physical books. And as the shift in digital grows stronger, browsing for new content is much easier on a Nook than aimlessly wandering the aisles at B&N. If bookstores can make themselves more of an entertainment minded buisness (like movie theaters 7 coffee houses, etc) then I think they can survive. Otherwise, I'm afraid the majority will slowly fade away. There's a fundamental difference between the record to bookstore comparison and that's this decade's surge toward online book sales. While people argue whether physical books will be replaced by e-books, the shift of reader's buying patterns from in-store to online is impacting bookstores as significantly as any other factor. There's a big difference between books and music that I think will slow down the demise of the bookstore. Piracy of music and ease of sharing is what led to the demise of the big box music stores. It's much easier to make a pirated copy of a cd than it is to make a pirated copy of a book. With a cd, put it in the cdrom, rip it, and then you can make as many copies as you wish and upload to share with all your friends on the internet. With a printed book, it's very time consuming to scan in 300 pages and then put all the scans into one file. I can't see anyone doing this. The other thing is file format. The format for music is essentially standard. You can take music from any cd and play it on a computer or ipod or mp 3 player. The file format for ebooks is not standard. There's some compatibility, but it is not universal. Which makes it difficult to share ebooks. I think looking at what happened in the music industry is a worst case scenario for books, but I don't see it happening for the reasons I've already stated, hard to pirate and nonuniversal file formats. As for Borders bankruptcy, I think it's jumping to cause to blame ebooks as the cause of their financial problems. I think the reason that they're having financial difficulty is because they were trying to be too many things. By selling books and music and movies, they don't offer a wide selection of any of them. Why would I got to Borders to look for a new book/cd/dvd when other places have a better selection? If their sales of music and movies were strong, then the small loss of sales to ebooks would have been absorbed. I guess I don't really care if the mega-stores close as long as we're still printing physical books. I'm all for the used bookstores and independent bookstores – maybe it should've remained that way to begin with. From what I can see, bookstores are always crowded, it's just that people aren't going there to buy books, but to be in the atmosphere of "the bookstore". They'll just have to change their business model somewhat. Less money, more creativity. Yes, you can fire me now. Cathy and Nathan – I loved Cody's too. Spent much of my college years browsing that store. There's still an empty space on Telegraph. Five years later, and no one has rented it. I think Bryan has a point about the move back to independents as the larger bookstores close down. And don't forget about video stores. Yes, your last comment about vinyl coming back is true! The last time we went to the jazz club, they were offering the same live recordings in CD format or Vinyl – (after all – a lot of those old albums are collectible because of the cover art). As for book stores, I would be a supporter of any indie bookstores I could find, mainly because I don't read most bestsellers, or what's trendy. Book stores need to become even more involved in their community by perhaps acknowledging all writers (established and new) in the area and perhaps looking at how they can create partnerships with them (regardless of publishing platform). It depends on how we as buyers shop and where we shop – there should be room for both indie and box stores if they serve different purposes. Some things have to morph into new entities, but evolution can be slow. Interesting comparison! You may be onto something. Out of curiosity, since I live in Canada where Borders doesn't exist, what about bookstores that diversify into games, gifts, office items (like bookends, globes, whiteboards, novelty pens, etc. ), and toys? My local big chain bookstore (Chapters) has a children's section that is almost half toys, yet the selection of books is on par with Borders or Barnes and Noble – way better than WalMart. I think they could make it. I just have to point out that Vinyl is an entirely different animal. Not that that devalues your point at all, but because of the DJ phenomenon and the fact that many audiophiles such as my luddite self prefer the warm analog sound it produces, vinyl will hopefully never go the way of the cassette tape. I can't think of anyway to relate that to bookshops. Chain record stores failed because they were bad businesses that sold bad products, not because of the mp3 format. So in that sense, the dead/dying chain bookstores are similar to the old chain record stores in that they don't sell what people want. All thriving record stores today highlight music from independent labels, even if they stock the latest hype from majors. Indie labels started and continue to lead the vinyl revolution. A lot has to change on the publishing side for the comparison to hold. I certainly hope bookstores don't go the way of record stores. There's something about wandering around and discovering a book or an author you haven't known before that I don't think is possible in the digital world. With music you have a lot of arenas to have that experience, but not so much with books. But my question is, if bookstores go, will libraries too? Our library has a digital section that you can access online, but …. I think you're largely right, Nathan, but there are a lot of differences between how we consume music and how we consume books that may knock the parallels out of whack. The big difference, I think, is the social aspect: 10,000 of us will go to an arena to see our favorite band and share that experience, but authors don't tour at the same level. This social aspect carries over to the stores, too, in different ways: at music stores, there's music playing, whether it's Virgin's DJ or any of the people working there playing their favorite album. At a book store, there isn't (yet!) a mechanism for sharing like that. The takeaway for me is the sense of community and anything a store can do to build it up. Being a part of something bigger than "simply" selling books seems like the best chance of survival. And there, I agree, it's not likely to be the big box store as we know it today. As one of our BIG box Borders closes this week, Half-Priced Books just across the street is ALWAYS busy. They do not provide a cafe, they do not have tables full of books sold as real estate to promote the select few books – they do have all kinds of books and videos, etc. They have what they have when they have it, so you gotta keep coming back if you're looking for something else and the cost is so you'll take a chance on a new to you writer. Digital is not the only factor killing big box bookstores, it's the box and the fact that there is less and less on the shelf that the real lovers of books want. I understand the change. E-books are more convenient, lighter, and satisfy that "gotta have it now" mentality. But I'm an optimist and I have to believe that bookstores will survive. Change is an open door for the creative mind. Hybrid stores will probably be the result. Coffee, books, foot massage, get your taxes done…all in one stop. There's something abut walking into a bookstore where the resident cat welcomes you, rubbing up against your leg; the books are stacked all over the place, in an order only the owner knows; there are rarities, signed books, and first editions; the owner knows every book in the store and talks about each one with understanding and that love-sick look in his eye. There are still handfuls of people who truly love books, and because of them these stores eek out an existence and will continue to do so. A small, independent bookstore is something that I've only read about in books. I've never seen one in real life, nor have I ever heard of any that exist where I live. (I've always wished that there were bookstores like that around here, cozy and warm and containing a beautiful jumble of books you can't find anywhere else.) Nor have I ever seen a large urban book clearing house; I have heard of Powell's, but until this minute, I thought that it only existed online. I sure hope the local B & N hangs on. As near as I can tell, I'm one physical bookstore away from having to go completely digital, whether I want to or not. I sincerely hope bookstores stay in business. Comparing record stores and book stores are like comparing apples and grapes. Books are books. At their very basic, they're just paper. The only technology you need to get stuff out of them is the ability to hold them open and read print on a page. At their most complex, books have multiple text-based files that are readable on multiple devices. Regardless of the e-format and e-reader, you still need to open and read, only now you need batteries and memory devices. If the user has the smarts, or knows someone with the smarts, each story/file can be reformatted to work with the new equipment upgrades or on different readers. The book industry went from "one format, period" to "multiple formats using the same criteria". Plus, enough people don't like reading on screens that bookstores can survive if they adapt to their customers desires. Namely a variety of books they can flip through before they buy and customer service in the form of knowledgeable recommendations. Recorded music has always been device driven from the early wax cylinders and player pianos to the latest iPod and internet streaming and everything in between. Recorded music has always had some peripheral device attached to it that was supplanted on a more or less regular basis. Wax cylinders to gramophones with discs made of various materials. Next up were rubber 78's. Then it went to vinyl 78's to 45's and 33s to 8 track tapes, to tapes, to CDs and to down-loadable data files. The music industry has always had tech turnover. With the advent of digital files, it went from controllable serial-format based dispersal to uncontrollable multi-format spread through file sharing. In other words, the record studios and distributors gave away their controls and locks because they underestimated the desire of their buyers to want the latest tech as well as the latest music. As long as publishers and distributors don't fall into the "look, shiny new tech" trap, bookstores will still be around, they just may return to the small, specialty stores rather thank keeping up with the big chain stores. Big chains need knowledgeable readers as sales clerks and staff. Declining overall sales (likely due at least in part to piracy), and a shift to online music vending and digital music was enough to tip the balance away from profitability for most brick and mortar chains. Piracy, which can be also described as "sharing" or "lending" or "borrowing" (beyond what a printed book or actual CD or physical object could)is a real concern. Just when writers are finally learning how to go it alone in the digital world, again, they will have their wings clipped. They will need their legal people and reps to protect themselves. The copyright lawyers will probably walk away with much of the pie. Interesting post. I agree with Laural who stated that there will always be people who want to hold the real copy. In the end, I hope independent bookstores win out (thinking Sleepless in Seattle here). However, if they sold books at Ikea, I would be happy. 🙂 Books and Swedish meatballs. A perfect day. I was trying to get some CDs for my son for his birthday the other day (he's 24, but still prefers CDs) without ordering from Amazon and it was impossible (yes, I tried Target, but no go–limited selection). My husband is going to the ONE store in NYC that has decent selection. It's depressing….I now buy my books at Target–there's ONE shelf of decent trade paperbacks or I have to take the train into NYC and find one of the remaining bookstores there. I find it sad–I love broswing in bookstores and record stores…we have stores for everything else now–people are addicted to shopping, but evidently not for music and books. But, isn't this really what we currently have for bookstores? Smaller, independently owned shops that exist because the owners and staff are passionate about books, the bigger, regional stores and then the gigantic nationals? If anything, I think this speaks to the greater sense of segmentation the overall economy and market for goods is heading towards. We are not yet to a point where specialty stores across the board can thrive, but as the big players get squeezed out, the smaller indies have a better shot of creating and developing a following. Boarders failed, in large part, to mismanagement and a short-sighted (old skool) business model that did not allow for flexibility and new technologies and new ways of selling. (Very much like the recording industry.) The only thing Boarders got right in recent years was in trying to make their large cafe sections a community meeting place. I believe people have changed the way they shop in general. Pre e-books I was buying most of my books from Costco and Amazon. The bookstore was already at the bottom of my go-to places. Now it's a place where my kids like to buy late's while my husband browses the magazine aisle, and I walk around with a pen and paper making lists of books to purchase for my e-reader. True story. I like all my content digital. I wanna download music directly to my iPod. I wanna download books directly to my Kindle. It's easier for me. But that doesn't mean I don't like to walk around the bookstore and browse and buy older material which you're not gonna get digitally. So I think there will always be room for both. Borders isn't gone completely. And hopefully B&N takes a look at itself so it doesn't take a nosedive. Bookstores are still cool. Agreed on all points. I think the Costcos and the small indie bookstores will dominate (the latter not so much in terms of sales, perhaps, but…). Online advertising and word-of-mouth are going to be even bigger factors in the success of a book than they are now, and the Costcos and Wal-marts will carry those bestseller books and little else. The "collectors", comparable to the vinyl and CD lovers, will still desire the local independent bookstores. The comparison doesn't work because listening to music on my ipod and listening to a cd is the *exact* same experience. The only slight difference is I get to play Angry Birds while I listen to my music and it's tons easier to make a mixtape, I mean playlist. I think this is perhaps the most brilliant in a long history of brilliant things you've said. There's only one other outlet you've missed that I can think of: Airports. As long as people travel, and as long as we have to keep our iPods turned off for 15 minutes at the beginning and end of the flight, people will buy books at the airport. They might be only legal thrillers and Sudoku, but still. But then, those aren't really bookstores so much as kiosks, and we already see kiosks of books in all kinds of related retail (e.g. Home Depot sells home improvement books, wineries sell grape books, kitchen stores sell cookbooks, etc.). Well, you know, it is called Borders Books & Music. According to some folks, one reason Borders failed was because they relied on music sales in their stores. So in a way, Borders closing is part of the undertow from the music industry going down. The customer either selects the different materials to create their book with online and then goes to pick it up after a few hours have passed or they can customize their book from within the store. I suspect browsing the e-book kiosk and then loading your choices into your e-reader will replace browsing real books. It's interesting how MUCH "Look Inside" sections on books, when available, helps sell them. Also interesting: in the news, Amazon (and others) are now also moving to the grocery delivery business (right to your door). Soon, you won't have to go out for anything: your job, your books, your Christmas shopping, even your groceries and dog food. At one time, it was considered progressive. Now, it is lazy. It's bad business in many cases. So, NOW, if you have a REAL PERSON answering and responding, THAT is who you want to do business with, not some automated service. Anyway, I suspect it will get less and less personal and after that trend leaves us all feeling isolated in our little cubicles, community will return and ways of touching, connecting, interacting in real time will once again be in flower. like in letta me reeda you fo'tchine. I think its a pretty good comparison. A lot of people want quality stuff, be it books or music. I love browsing the local old/new record store simply because I can stock up on the stuff I couldn't buy when I was younger or bought the hit 45 from the album and now some thirty years later looking for the album it came from. One data point that says that record stores and bookstores are similar: I almost never bought a record (tape, CD, whatever) at a record store, and I almost never bought a book at a bookstore. Personally, I think that paper as a mass market book medium for fiction is doomed. I've been reading for, um, well, let's say over half a century, okay? I'm done with paper books for fiction. I can get e-books so much easier and faster with an e-reader, I can get them for less money, I can read them in type that's large enough I don't need my glasses, and when I'm done, I don't need to store or dispose of the book. I don't miss anything about the paper book experience. I don't have any reliable data, but I suspect that the median age of serious e-reader users is probably over 40 (okay, in part because of the current cost). Tech books I still want in paper, so that I can flip pages, highlight in multiple colors, have multiple books open at once, stick other documents in at various spots, etc. All of the "bookstores need to be community centers" suggestions are fine, but how does the bookstore monetize that? I go to a couple of bookstores for meetings, and I've never bought anything. The chairs are full of people who don't seem to be inclined to buy anything, either. One of those bookstores (a Borders that is closing) has a resident homeless person during operating hours. He goes outside to panhandle in the parking lot, then goes back in to relax, cool off/warm up, and use the water fountain and restroom. A bookstore will never survive by pretending it's an unfunded public lending library that doesn't allow books to be checked out. A bookstore needs to sell books. If it makes money by selling coffee, then it's a coffee-house, not a bookstore. I'm thinking now, too, that the record store consumer demographic and the bookstore consumer demographic are two different demographic bases. Same with physical versus digital. Even now an entire generation later on from the breakout digital age the disparate demographics are markedly different. And the digital divide is growing. According to the U.S. Census Bureau's most recently published statistics, 2009. U.S. Internet connections by household: 76.88 percent anywhere; in the home 68.89 percent total, 63.53 percent broadband, 4.74 percent dial up. 23.12 percent none. One quarter of U.S. households do not access the Internet. Just one sample data point. For more see the National Book 2011 Statistical Abstract Index. I really prefer Barnes & Noble to Borders, simply because both chains had my works, and Borders chose to let Amazon.com sell comp copies along with their stock at pirated prices. B&N did not and does not. I also like the people at B&N; they are usually knowledgeable and nice. I'm impressed with what they've done with their online presence as well. Frankly, I'll be surprised–horrified, actually–if B&N goes under. (As for the independent bookseller, I've seen too many of my favorites bite the dust, e.g., "Chinook" in Colorado Springs, Colo. I'm still crying about losing them. Let's don't forget to factor in how many industries are being hit by our current economy. This bankruptcy and the subsequent store closings is not just about books, but is possibly about real estate as well. I don't see it as a trend, just a symptom. When the illness of our economy is cured the book stores will still be here. Although the thought of 'little' bookstores flourishing is a pleasant one and I would welcome them. May I again gently remind everyone a vinyl record is not analogous to a paper book? Music (and movies) never had anything remotely like a paper book. Music and movies were always recorded and transported and sold or rented as coded signals in a storage medium, and could never be experienced without one or more mechanical devices, as 12stargazers pointed out. Scored grooves on wax cylinders or wax, shellac or vinyl discs, magnetic signals on metal wire or metal or plastic tape, electronic signals on a plastic disc you buy or that you download and store on your own disc, the essence of music and movie systems is unchanged in over a century. The closest a book store could come to a record store would be if it sold only CD audiobooks and CD e-books. A rather limited niche! A record store would only begin to slightly resemble a book store if you could experience any record by simply picking it off the shelf and opening the packaging. Chalk and cheese! Mira asks interesting questions about printing costs. My general understanding is that both printing and handling costs are already lower than people think. It seems the next big thing is High Speed Inkjet Printing, which promises to combine print-on-demand's flexibility with the lower costs of offset printing. I assume High Speed Inkjet Printing is very different from the sort of inkjet printing we writers know and hate! Good points, Lily Cate! People love doing things in many different and seemingly redundant ways. At the dawn of home video decades ago, who would have predicted hundreds of millions of people would leave their home video systems in the depths of winter and pay a total of over two billion dollars to see a single Science Fiction movie in theaters? Bryan Russell's Chapters woman intrigues me too, and provokes similar questions. Is she a threat or opportunity? Imagine a small store with a small physical inventory, but one or more Espresso Book Machines or similar, and a wireless hotspot system for e-book ordering and downloading, possibly discounted as Bryan suggests? Also a REAL espresso machine, of course! Now I must go shopping before that dang blasted Sears Roebuck mail order catalog puts all physical stores out of business and we all starve to death! That will happen before the year 1900! Mark my words! Our local Borders closed. A crushing blow to our small town, and our small town authors (me included). I can see the comparison, it makes sense. There are still a few record stores open in business, but it can't be denied that the industry has gone down some since the age of iEverything emerged. Well, perhaps record sales have dropped off, not because of piracy, but because there's not the quality of music or the originality there once was. Ok, I'm in my fifties, so it could be argued I'm stuck in the music preferences of my youth. However, I do like some contemporary music, just not much of it. The sixties and seventies and eighties was an exciting time for music as there were so many innovative trends started: rock 'n roll, heavy rock, pop, heavy metal, electronic rock, psychedelic music, progressive rock, punk, etc. But now it's mainly a repetition of what has already been established. Rock bands have become passe to some extend. Well, that's what I feel when I watch people strapping on ye olde guitars and singing into the mike. And the decline of book sales? Could it be there's always a market for what people like to read? Books such as the Twilight and Harry Potter sagas have walked off shelves, desite other innovations such as social networking and whatever, because they're a delightful read. Could the quality of many books also not be what they once were? I'd like to argue that the high brow literary books are often not appealing to the masses as they're sometimes downbeat and heavy of spirit containing clever words without fun or soul. Perhaps the majority of people like to have fun when they read and immerse themselves in a world that's more like the kind of world they'd prefer to live in, to read about people that inspire them, not drag them down to the depths of despair and superficiality. Criticizing an analogy by saying the two things are different is more than a bit ridiculous. Of course they're different. It's an analogy. It's designed to focus us on the similarities. One variable to consider: Libraries. Libraries are essentially big box stores with similar overhead but no profit. They will cut into the independent bookstore market by providing that knowledgeable person who can point you in the right direction. How will that affect the book store culture? And how will it change the voting and buying patterns of those of us who love both bookstores and libraries? My library is now part of a consortium that offers ebooks and audiobooks online. Will that affect the market? I'm eager to see. And no, libraries aren't bookstores. And apples aren't oranges. And books aren't ebooks. Just so we've covered those. I've been thinking about this same thing for a while. People will always choose that which is more convenient and cheaper, but there are also a lot of people out there who collect vinyl because they love the look, sound and smell of old records. I am one of those people who views the decline of the "analog" book as an opportunity to pick up some great additions to my library at book sales and garage sales. "Piracy, which can be also described as "sharing" or "lending" or "borrowing" (beyond what a printed book or actual CD or physical object could)is a real concern." I know everyone thinks this is the case. But it's not. And I'm not a pirate and I've never downloaded anything this way in my life. I'm an author who has been pirated many time, and I've learned a great deal about pirates. Not only do they help promote books, they also have some valid reasons for pirating. I know it's illegal. I'm not for it. But I know for a fact pirating can be very advantages to authors. And, many pirates actually do buy books they love. Personally, if I were an author right now and I wasn't being pirated, I'd be very worried about what I'm doing wrong. I type too fast sometimes. It is a comparission that has been made numerous times. Powell has already claimed that digital sales are hurting their stores. Outside of Powell's though we also have Half Priced Books, which sells not only books but CDs. As tablets take off, and Amazon and others continue to support various formats, I don't see a long life ahead for bookstores. I do see more 'exclusives' coming down the road, such as AC/DC did with Wallmart/Sams, and the Eagle's. Exclusive distribution will be something to look out for unless authors somehow manage to 'do it for themselves' as the digital prices and profits for the authors seem way out of line still. Having worked at a chain record store myself in the late 90s (HMV, back when they were briefly in the US), and having witnessed HMV's slow but steady rise and ultimate and sad demise (not to mention witnessing the Universal/Polygram merger in '98 and its aftershocks in the music biz), I can definitely see the similarities. I've frequently seen large box stores and anchor stores at malls touting the "We have everything! In multiple copies!" line, and for awhile they work, but ultimately, unless they're like CostCo/WalMart and are focused more on profits, these large stores are going to fade away after a time. I think this is why Amoeba was worked so well–they're like a combination of a big box store that acts like your favorite small indie store. On the other hand, I've also seen 'eclectic' stores that barely stay afloat and also go away…there, I'd say one can only be so eclectic before it starts backfiring. That's not to say eclectic is bad as well–I've been to Aquarius, and though their stock isn't really to my tastes, they definitely work well where they are, given the neighborhood they're in. Bookwise, I think this is why Green Apple out in my neighborhood (Richmond District) works as well–they're quirky yet don't alienate–and given their size, they're able to stock a goodly amount of titles. If anything, I'd say all three of the plans you mention would work, depending on where the store is situated and what they're willing to sell. Facebook will never replace the value of spending face to face time with a friend. Email will never replace the value of a handwritten letter from a person who lives across the country or maybe even across the world. I think the process will reverse itself. I think printed books will wither under the next generation's practicality. Then the generation after that will realize how cool printed books were, and it will become a hot commodity again. Bookstores will arise from the ashes. It's like the real estate market, or the water cycle, or bell bottoms. Don't worry. It might get much worse for bookstores. But then it will get better. Digital music means I can have all of my favourite music at my fingertips, in one little device. I put it on shuffle and have track after track of random pieces of my favourite stuff. Beethoven followed by Mumford and Sons followed by Muse followed by Rachmaninov. It's a fantastic way to listen to music. There are some independent record stores in Minneapolis and I hope that some of the independent book stores survive. I think that Barnes and Noble was smart to enter the ereader market with the Nook but Borders didn't really have their own. The comparison with music stores may be slightly helpful, but there's a big difference between music and books. Music is a performance art. Physical records/tapes/CDs are not regarded by buyers as crucial to a musical experience. They are simply different means of transmission (the cover art & packaging is not the main thing at all). Music via digital files loses virtually nothing of the experience. Books, however, lose a significant part of their utility and reader's experience in digital form. You get the text, the information transmission. You lose the paper, structure, page and book design, the physical form of what is a practical and elegant structure for portability, note-taking, and efficient reading. Even Bill Gates recently said, "reading off the screen is still vastly inferior to reading off of paper. . . . it's quite a hurdle for technology to achieve, to match that level of usability." I'll be sorry to see the megabookstores go — if they do. I don't see any reason to fear that happening right now. What's going on is a matter of downsizing. Some places aren't doing enough business to support the size of the stores. I don't foresee the loss of all Borders and B&Ns, not to mention all bookstores. Stores and chains come and go, that's all. In terms of Bill Gates speaking up about something, it wouldn't surprise me to learn that he'll 'fix' digital reading and make sure people get that optimal experience with the new Windows Tablet! Are record stores and bookstores comparable on some level? Absolutely. On every level? I would have to disagree. Music is all over the internet – on iTunes, Zune, YouTube, etc. It's easy to find a song somewhere and listen to it a few times to get it out of your system without contributing a dime. And personally I find that I usually enjoy a few tracks off an album rather than the entire thing, making the opportunity to buy separate tracks digitally extremely convenient. I've noticed certain Borders offering the chance to do this and burn a CD in-store, and maybe the remaining record stores would also profit in doing this if they haven't already. However, I would say books are more comparable to something like shopping for clothes. A lot of people buy dresses, shoes, accessories, etc. online, and brick and mortar stores have suffered for it. But in reality, a lot more people need the comfort of trying a product out first before they're willing to buy it. One shirt may not fit, which you know because you tried it on in the dressing room, but maybe there's something else on the same rack that will. With music, we have the opportunity to try it out when we listen to the radio or the 1:30 preview option on iTunes. With books, many sites offer the opportunity to read a preview, but not everyone is a voracious reader willing to give anything with an interesting hook a try. Many times people need an hour or so to sit down, read several chapters, and really get into the story before they're willing to put down money for it. eBooks don't offer this opportunity. You don't get to sample the entire product to find out if it's worth your money like you do with music on the radio, and that can make a huge difference as to whether or not someone is willing to pick up the eBook. It would be interesting to know how many eBook buyers go into a bookstore first to check out a copy and see if it's something they think they would enjoy. Lastly, there's very little difference between listening to a song on iTunes vs. listening to it on a CD you bought from a store, but there is a considerable difference between a book you buy for your Kindle or Nook and a book you buy from your local B&N. There will be a market for the latter for a very long time, and while we're seeing a significant downsize of bookstores, I don't think we can count them out just yet. After all, many are wising up and selling things other than books now (music, DVDs, puzzles, games, coffee, etc. ), helping to boost their sales and get more traffic in the door. I don't remember music shops doing much more than selling posters or books of music in their dying days. I still think that there will always be people who like to physically hold a book while reading it, just like there will always be collectors of vinyl and those that buy CDs as long as they continued to be manufactured. I've already stopped buying CDs, though. iTunes is much easier, much cheaper, there's no maintenance as long as you back-up your purchases, and the music can be made portable. No CD cases or the discs themselves taking up space, either. That's huge when your first love is music and you have over 200 discs by the Grateful Dead alone. Is there an iPad in my future? Probably, but I still love holding a book in my hand. One difference with music vs. books, though, is that once people realized that the actual compact disc itself cost less than $0.99 people suddenly weren't so keen on paying $18.99 for an album at a chain store when much of that was going to a middleman and not the artist itself. I don't think that people look at books the same way, the exception being the outrageous prices for academic textbooks. Speaking of vinyl, the guitar player for Boston, Tom Scholz, is also an electrical engineer and MIT grad. He said he's take the first pressing of a record and a good needle over a CD any day. Actually, there are people out there saying that ebooks shouldn't cost what they do because they have NONE of the costs of a print book. They mean printing and shipping. They conveniently refuse to think about editors reading manuscripts, editors editing manuscripts, design, publicity, selling, and paying the author for his product, just to mention some of the main costs of a book. I guess they consider them "middlemen". We take books so for granted that we forget what a masterful design they are. Bill Gates was saying not just that tablets don't match the functionality of paper, but that he can't envision them matching it — doesn't sound like the next device will do the trick yet. Because I read the Gates quote only a couple weeks ago in the Washington Post, I assumed the quote was recent. But when I googled to see if there was more context than the Post article gave, it appears that Gates spoke those words in a speech over 10 years ago! Obviously, things have changed since then. My guess would be that Gates has partially, but not entirely, revised his verdict. Speaking for myself, I find the e-reader experience unsatisfactory and less useful in several respects. Other people claim to have gone entirely digital; presumably they do not find e-readers lacking. Both e-readers and books have the essential content, but I love the sensorial aspect of reading a book: the touch of the page as I turn it or the sense of security in holding onto it as I'm reading, the smell of the paper which actually absorbs the smell of my home environment over time, the look of the word on the page as natural light hits it, the often beautiful book cover art, the soft sound of the turning page. There you have it for me: sight, sound, smell, touch. A real book has all of those, and as a human, reading this way gives me the feel and sense of completeness. I think there will always be a need (and want) by Customers for bookstores. Walking in, looking around, touching the book, browsing through, seeing titles you may not have even heard of, is all part of the fun. Although as you mentioned in your post, there will no doubt be a decline in bookstores, I would hope there is always a bricks and mortar store around to walk into. A towns local bookstore have been part of society for a long time, and I hope it would always be that way. Even as an online specialist bookstore myself, I always want to see a bricks and mortar bookstore around, it wouldn't be the same without them.